When I say the word, there’s hesitation in my voice that I can’t help as soon as the first consonant leaves my tongue. The hard tuh sound gives way to a pause, followed by the rest of the word, an apologetic avalanche devoid of any rhythm as the letters tumble forth. “There you go!” I mentally add like a flourish whenever I tepidly try speaking anything from my parents’ mother language, masking my embarrassment with an aw-shucks attitude that actually feels more shameful than anything. My lack of confidence reveals itself every time I try another word. It means vanity, or in my case, a word that I use to refer to most dresser drawers — or drar, as my Southern upbringing taught me. I say the word with a flat American accent, devoid of the impressive acrobatics my mother’s tongue performs when she pronounces the word with flexible ease: toookadooor. A clip at the beginning, then an immediate plunge into a soft, gentle slope. When it comes to speaking my mother’s language, I have the same shame a tourist might feel when speaking to a local. The difference being, of course, that the feeble attempts take place in my home or among my family members or around my mother’s friends. Generally, it’s for show. My mother is sitting with her friends during a party. They’re at the kitchen table, chatting, laughing, eating, drinking, when I happen to walk by. My mother needs me to fetch her a plate or a drink, or she wants me to eat more or stop by to say hello to everyone. She speaks with a quickness that comes from conversing in full Tagalog with her friends for these past few hours. None of that slowed-down cadence she usually reserves for me. I grab her a soda, tell her I’ve had plenty, look around the table and do my best to seem friendly. The faces around me brighten. “Oh! She understands Tagalog?” they ask, words stretched out with curiosity, a question usually asked in English, sounding somewhat impressed that I’ve responded to my mother’s untranslated orders without missing a beat. But my mother or I will pick up the familiar thread, explain how my competency goes as far as listening but not speaking, and her friends will nod along, heads tilted to the side. Some will have stories of their own progeny and their levels of so-so understanding. Others will show their curiosity, chuckle, and see how much my mother’s daughter really knows. I’m a good sport about it and play along, rattling off the names of a few basic household objects I hear often. If I feel particularly exposed, I’ll throw in a joke about how I can still understand if they talk about me. This gets a raucous refrain of laughter, and I can comfortably excuse myself, earning a point for humor, if not competency. To a certain degree, there will always be a language barrier between me and my parents — time, age, gender, rearing, and generational differences are just a few of the circumstances that give each of us our individual means of communicating and interpreting the world around us. But whereas my mother’s colloquialisms might liken a two-faced person to a many-sided star fruit, or I might use salty to talk about how she holds a grudge, our vernacular differences don’t start or end there. We have an added layer that gives room for error: an actual language barrier, compounded by my subsequent guilt and shame, which often keeps me from asking for clarification. Growing up, my mother, sisters, and I always had serious discussions around the kitchen table, usually pre- or post-meal. We’d either be elbows deep hand-rolling lumpia, Filipino egg rolls, or we’d be collapsed in our seats, stomachs full and plates sticky with rice and sauce. We’d find ourselves in sober gossip over family news or the Philippines. My mother would trill through the story, her pace quickening as she got to the plot twist. I’d do my best to follow along, feeling myself mentally translate as I mechanically roll the lumpia meat mixture into thin wonton wrappers until they’re tight like a cigar. It was when stories got too confusing or she spoke too fast that I’d ask for clarification. That in itself could be bothersome. Too much ruined her buildup to the punchline. Too little and I didn’t even understand the punchline. I aimed to stay at one or two questions to keep the story moving along and my mother none the wiser. But I always reached that point of saturation where her words fell over me in quick rushes, rather than absorbed and processed into a mental picture. I’d do my best with the gaps, logically filling in points about where my cousin was during an argument with my other cousin, or what foods they had at the family party, but it felt like a bad game of telephone. There were oftentimes more blanks and question marks about the narrative than not, and sometimes I felt too disappointed in myself to ask. That isn’t to say that my mother doesn’t understand English or that I don’t understand Tagalog, one of the official languages of the Philippines. My mother studied English in school — what with the Philippines being a U.S. colony prior to World War II, English was always taught in schools. And as the first person in her family to go to college, a brazen saleswoman in the fish market, and the most sociable in her friend group, my mother had the foresight and extroversion to value and exercise English in her repertoire. When she moved to the U.S., she could speak and understand English effectively. But even as a kid, I remember her signing up for Toastmasters to help her with public speaking, and later taking English classes at the local college after work, honing her reading and writing skills. As for myself, being reared Filipino, I picked up vocabulary by happenstance. There’s only so many times that my mother can ask me to grab her a fork before I understand what tinidor means. I never fully understood or appreciated how brave it was for her to put herself out there, exposing herself to learn something as abstract as a new language. But speaking English and devoting ourselves fully to the American way was my grandmother’s choice. Imagine two little Filipino girls around the ages of four and five in a basement apartment in Jersey City. They’re cute. They have big cheeks, black hair, and tiny ponytails. They dress similarly. And they speak Tagalog with their parents. They speak it in the same questioning, stunted way any toddler would. Those are my older sisters. What I understood, growing up, was that my mother’s eldest children spoke her language, before her mother made them stop, an intentional decision that would pave the way for many other submissive choices, like where would we grow up or who we would play with or what kindergarten class we’d end up in. A lot of that was the result of happenstance, timing, and a little bit of luck. But it certainly feels like removing that language barrier played a big role in how things turned out. Speaking English meant being American, not sticking out. It meant watching my White counterparts carefully starting at a young age. It meant emulating what they did or wore or spoke. It meant feeling weird at a friend’s house for dinner when there were bread rolls instead of rice. And it meant not inviting classmates over during group projects, because my house might smell like frying fish. It meant feeling weird and ashamed about that, because I absolutely love the smell and taste of fried fish. It meant belonging. It meant not giving anyone a reason to question that belonging. But it also meant giving one culture power over another. It meant that that culture was the one that was correct. Assimilation is a two-pronged carving knife. It holds you down and forces you to look as you, the outsider, are made hyper-aware of being an “other” in everyday situations. You feel it when you enter a room full of towheaded, blue-eyed kids at daycare; you see it in the self-conscious way your impressive father recedes into himself when he takes you to the PTA play after school; you notice it in the impatience behind you when your mother asks a few more questions at the register, her accent seemingly more prominent now. When you’re young, a lot of choices are made for you to set up your path towards adulthood. This can be anything from your parents signing you up for dance class or even the house they chose in the cul-de-sac. So maybe, through a bit of grumpy, self-consciousness on my dad’s part, advising that his children speak purely English set us all up for easy assimilation, lest we embarrass ourselves at school. For years, I believed this was my grandmother’s decision. My Lola, my grandmother, lived with us when we were growing up. She had her own room, she wore the same large houndstooth cardigan on her small frame every day, and she wasn’t shy about saying how much she hated being in America. It may seem shocking, but not everyone wants to be here. And it’s not for big reasons like how America is hard, cold, and vast. America just isn’t welcoming to those fresh off the boat. More importantly, America is boring. I’ve seen relatives come to the States with tepid wonder, get homesick, then become bored. And I’ve seen those same relatives wait and bide their time to return to the Philippines, packing up large cardboard boxes full of treats from America for the day they go back home. America is a house in the suburbs with a central heating and cooling system, insulated to contain it all and preserve comfort. The Philippines is a small house off a dirt road with a circulating fan and open windows for your neighbors to call out to you through — you wander outside to visit others and you keep your door open during fiesta. There’s freedom and mobility in the Philippines. Everyone understands you. You have friends you’ve grown up with. Plus, the fiestas are more vibrant than any backyard barbecue and the food’s ten times better. My Lola chose that life, with the rest of her sons and daughters, over staying with us in America — and I can’t blame her. I wonder what it would have been like for my mother or even us kids if my Lola had stayed. I romanticize that I would know more about the Philippines or our family’s history or even those delicious family recipes my mother cooks by heart. But that would have only been possible if the States had made Lola happy. If she were open. And if I were open too. My Lola spent her life walking in her barangay, selling fish door-to-door, having regulars and favorites who lovingly gave her a nickname and reliably purchased her produce. Lola wasn’t meant for a life so padded, like what she found in the States. But before packing her bags and getting out of town, I thought my Lola left us with a resounding choice that helped usher us into American culture: demanding that her grandchildren speak only English. For years, I unfairly resented her, thinking she did it out of self-consciousness, building a wall that separated us from the rest of my cousins on that side of the family. The ones who knew her better and knew the Philippines in a way that I never would. My dad was the one who named each of us. Birthing three girls, my mother certainly had opinions on names, but my dad’s will won out each time. It set a precedent for us. My dad’s word was final in our house, and it was made all the more powerful because my dad was a man of very few words. My mother used that stoicism to stump us. My dad hardly spoke to us regularly, and his quietness was comforting, but could become intimidating with a few prods from my mother. Did I want to go to so-and-so’s party? My mother would be fine with it, but what did my dad think about me being out so late? I wanted to go to New York for a school trip. My mother liked the idea, but what would my dad say? This is why I was slightly confused when my mother told me that my dad purposefully spoke English to us as young kids. When had my dad ever spoken to us without it being a request to do a chore? I constantly nettled my dad for conversation while I was growing up, and he kept his responses to a word or a single sentence. It was impressive, if somewhat frustrating. When he’d meet my teachers, he kept himself at arm’s distance, keeping small talk to a minimum and nodding along rather than speaking. But he did speak English. My dad moved to the States before he met my mother. He liked old American movies and rewatched Elvis concerts on VHS. I saw him laugh once at a joke the flea market seller made at a stall. But when it came to speaking to my friends’ parents or even ordering burgers at Wendy’s, my sisters or I took over. According to my mother, my dad made the decision to assimilate our speech because of our neighbors growing up. The family next door had two little kids who spoke Tagalog and didn’t understand anything else. When they went to school, they’d be pulled out of their classes because of the language barrier, and they’d struggle during the day to communicate basics like going to the bathroom. My dad heard this, and like any parent, decided then that his own kids would avoid that treatment and embarrassment. So he only spoke English at home. The teachers spoke English at school. And soon, English won out. It feels unfair, although understandable, that my dad did this. He was the adventurous one in his family who first laid claim in Brooklyn. He knew more about how the States worked. He intimidated most people by his handsomeness, his height, his calculating eyes, and less talkative nature. And yet, dealing with Americans seemed to make my father recede into himself, back to shyness and deference. I picked up the slack, naturally, my connection to my father slightly subservient, which doesn’t make this English edict so surprising after all. When I pressed my mother about my Lola, she explained how her own mother didn’t have a grasp on the English language while she lived in the States, though her granddaughters were quickly picking it up and were therefore unable to communicate with her when she took care of them. It made Lola nervous, slightly impatient. She didn’t have very much schooling either, and she always knew she’d go back to the Philippines. And while she didn’t actively fight for us to assimilate, her leaving us cemented that path and widened that void tenfold. I found out this year how wrong I was about my Lola. And I have fresh guilt at my unmerited thoughts towards her over the years. I feel guilty thinking she could have made a difference in staying with us longer, even if she was unhappy. But more than that, I feel a slight shift in how distant my sisters, my mother, and my dad are from the rest of my extended family. How my parents’ good intentions might have separated me even more from my own culture. My mother offered facts about my Lola, maybe as an attempt to ease my conscience, maybe to make sure I honored her properly to make up for lost time. But as she laughed and told me the truth, my mother said something that struck a chord. In the Philippines, many of my relatives have ears for English, learning it in school but never really applying it through reading or writing in their day-to-day. I’m the same, according to my mother. Just the opposite. She said all of this in Tagalog. My dad retired when I was in middle school. Like my grandmother, he went back to the Philippines, where people understand him fully in speech, mind, and spirit. He likes hanging out at the corner with all of his friends from childhood, sometimes drinking, sometimes playing cards, oftentimes reminiscing. He likes being in the barangay where people know and respect him and know him well enough to call out his nickname when he walks down the street. Like my grandmother, my dad prefers the Philippines with its warm temperatures and warm people, leaving us in this weird limbo of his making. He’s back to feeling whole and comfortable again. Everyone goes back to feel that way. Where can I go to feel whole again? Today, I present more American than Filipino. My accent is flat without any twangs, despite growing up in Georgia — though, I admit, I will flounder on the word drawer and drar at times. My behavior is very American and blunt, too. I prefer to hash out my emotions when I’m mad or sad, and I choose to date white men, rather than find a nice Filipino boy to settle down with. I’m barely able to cook my mom’s recipes, no matter how hard I try. And I sometimes surreptitiously pull out my phone while at a Filipino restaurant to navigate the menu. Personally, it feels like all the interesting parts from my family have been ironed out of my whole body. I wish I could talk about Filipino traditions or experience them first hand. I wish I could name some off the bat as examples, but I can’t without looking them up or calling my mother for guidance. The fact that I don’t even put enough garlic or salt in the nilaga, Filipino chicken and vegetable stew, is a funny, albeit mean, metaphor for my American starchiness. I grew up gauging my own sense of self based on how well I blended in and judging others who did not. I lived life with one eye trained on my peers. Anything they would do, I was two beats behind doing the same thing, pretending I was right there with them all along. When my classmates showed up to lunch with peanut butter and jelly sandwiches, I would toss my Tupperware of rice and adobo to the side and drag my sister to the store later that evening. When everyone was having sleepovers, I did the same, but I’d plan to order pizza, rather than having my mom cook. If she did, it was always rice and some sort of ulam — a protein or a stew to accompany the rice — and depending on the dish, I’d watch my friends pick at it, their kid-faces unable to hide their disgust or confusion at this sort of meat preparation. In retrospect, this recognition feels like an extension of my father’s original edict: only English at home. Or in my case, only food my English-speaking friends would eat at home. There’s an inherent sadness when traditions fall away, when they are passed from parent to child. It’s an accepted form of evolution for sure, but there’s something about chopping off that appendage to survive that feels heartbreaking. I think of traditions like passing down heirlooms. Think of the ‘80s wedding dress a mother might want her daughter to wear. The daughter might not want it because it looks crazy dated and doesn’t suit her modern tastes. The mother might hope her daughter will wear it because it would mean a lot to see it on her daughter. In my case, my mother jokingly points out that she was too poor as a kid to really have any heirlooms to pass on to me. The few things I can take of hers are ephemeral — her recipes, her language, her stories — and through my own ignorance and laziness, I passively refused them all growing up, allowing these traditions to fall through my fingers, subconsciously deferring to my dad’s command all those years ago. At first, I saw that distance from being “other-ed” and fully embracing American norms as a success on my part. I ate and acted and did “normal” things in public that made me less self-aware — but now I’m realizing that I’m bland as crap. When you’re the first generation growing up in the States, there’s guilt and pressure buzzing in the back of your brain at all times. You constantly live life this way, so you don’t really notice until you make big decisions, like “What do I want to do for a living?” or “Should I move to the city?” that this is a thing you carry with you, always. You use this ruler as you consider yourself versus your parents versus you as an ambassador for your own culture at all times. Me not knowing my language is a strike against my being a proper ambassador, but me being properly American is a point earned. It’s a hard balance to master, and as you age, additional considerations begin to emerge, like the success axis, the pride matrix, and the guilt index. I’m ashamed and disappointed that I can’t replicate Tagalog words just so. “Oh, I can’t speak it, but I understand what you’re saying,” is my personal refrain, one that I feel is pretty common among fellow Filipinos who grew up in America. Yet it feels like a hollow promise, something I use to overcompensate and protect myself, because once the party gets going or the lone, shared glass of liquor makes its way around the table — Tagay! — then keeping up with the conversation is harder than trying to sing Eminem on videoke. I’ve gotten good at reading body language and paying attention to cadence to compensate for my lack of language understanding. I try my best to look up words later or whisper-ask my mom for clarification, but a lot of this gets old after a while. Each question compounds upon itself and feels slightly more shameful each time I ask. As a kid, you get away with it. There’s an adorable pass or excuse for shyness that protects you. As an adult, you have to learn to admit you have no idea what anyone’s saying and you have to wait for someone to explain it to you. Or you just do your best to get by. You try your best to learn it yourself, maybe more formally, maybe haphazardly. You download apps, you read books, do online flashcards, make time to speak to your mom. All the while, you can’t help feeling the irony of how you’re asking to be let back into the culture you wholeheartedly discarded before. It feels much harder, almost silly, asking to be let back in. You feel like you should have been there all along. 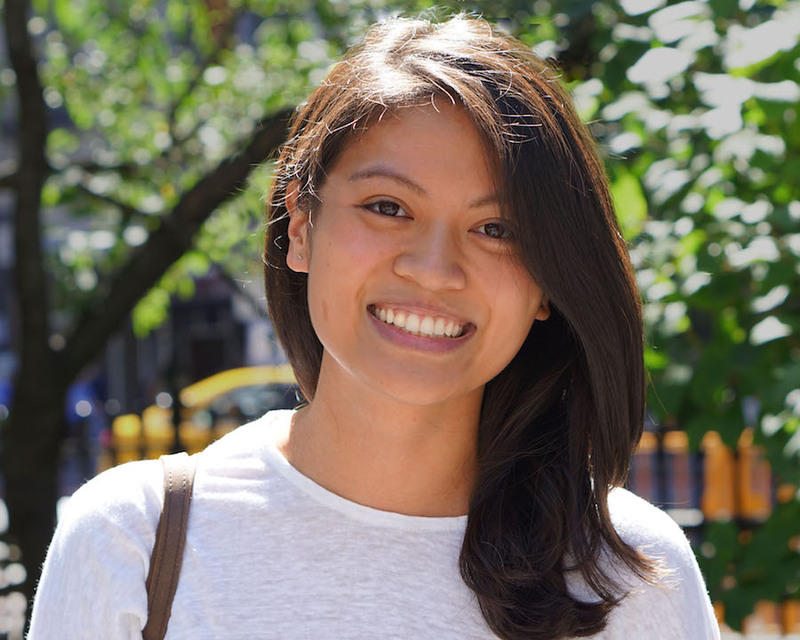 Georgette Eva is a writer and community builder living in NYC. She grew up in Georgia, which has no bearing to her name, and wrote for sites like Bustle and The Boiler Journal. By day, she helps freelancers and entrepreneurs find inspiring spaces to work and connect. Featured image courtesy of Wagner Cesar Munhoz.